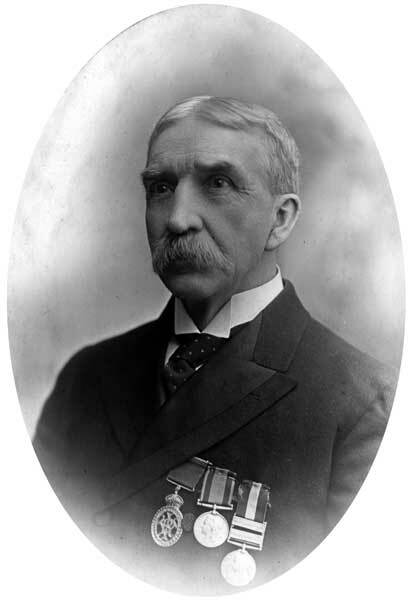 Soldier, lawyer, civil servant, MLA (1879-1883). His continuing involvement in military matters resulted in him organizing and taking command of two impressive sounding local militia units—the Emerson Infantry Company and the West Lynne Artillery Battery. In politics he was elected to the provincial legislature in 1879 and served until 1881. He resigned his seat to take up the position of Dominion Lands Registrar. He also served as Mayor of Emerson for three terms from 1882 to 1885. He was active in the Orange Lodge and served as Master of Lodge #1332. He was also secretary of the County of Provencher Lodge. He was a founding member of the Emerson Masonic Lodge. He was married to Katherine Margaret Armstrong (1860-1891), daughter of Edward Armstrong. They had a daughter and three sons. In April 1885 he enlisted in the 91st Battalion and served as a company commander in the North West Rebellion. In May he was promoted to Major and returned to Emerson in June to a hero’s welcome. Poor health and his complicity in Emerson’s financial problems forced him to resign permanently from political and military life. He moved to Winnipeg in 1886 to take up a position in the Land Titles office there. He died at his Winnipeg home on 26 April 1917. Manitoba Gazette, 2 January 1880. “Wm. Nash passes away,” Manitoba Free Press, 27 April 1917, page 3. We thank James McClelland and Stan Barclay for providing information used here.